So what are input lag and inverse ghosting and what role does overdrive play in causing them? Thanks to the near universal silence on these matters from monitor manufacturers, facts are hard to come by. The basics of overdrive are well-enough known as it’s a common technique for creating a cheap panel with a fast response time. 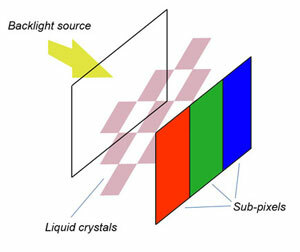 If you’re not familiar with the basics of how an LCD panel works, you might want to read up on this feature, but overdrive is a technique that involves using higher levels of voltage to make the liquid crystals in a TFT panel change colour state more quickly. Too much voltage will cause the pixels to overshoot the desired target state, and thus display an incorrect colour, so the voltage needs to be reduced before this happens. Overdriven LCD panels certainly have noticeably sharper, zippier image quality when displaying movement. However, close inspection of some overdriven monitors reveals that there's something slightly rotten going on too, problems which have come to be known as input lag and inverse ghosting. Crucially, the precise symptoms depend in part upon the type of LCD panel in question. 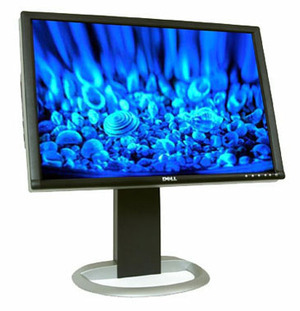 Currently, the vast majority of LCD monitors aimed at consumers are based on either TN or PVA panel technology. The former, as you may well know, is the cheapest to manufacture and therefore most common and tends to offer the best out-of-the-box pixel response while typically coming up short in metrics such as contrast, viewing angles and colour accuracy. PVA panels, meanwhile, are renowned for their deep, inky blacks, vibrant colours and ultra-wide viewing angles. The third major panel type is IPS. It’s the most accurate of the bunch, but is costly to produce and has largely been relegated to expensive professional displays that focus on colour accuracy above all else. Despite the many advantages of PVA panels, they’re tended to be weak in terms of response times. Until, that is, the first PVA panels with pixel overdrive technology began to appear around 2005. Probably the best known of these was Dell's 2405FPW, a 24-inch screen that shook up the industry by combing a glorious 1,920 x 1,200, 24in PVA panel manufactured by Samsung with a relatively affordable price tag. forums were awash with complaints of its perceived lagginess. The 2405FPW was quite unlike any monitor we’d seen before. It was huge, impossibly vibrant and, with a 16ms response time, appeared quick enough for gaming. It quickly became the monitor to have for PC enthusiasts. Gradually, however, web forums began to buzz with rumours of the 2405FPW’s supposed ‘lagginess’. This lagginess was distinct from pixel response. Rather than the screen displaying ‘ghosting’, glimpses of the previous frame or position of a window because the pixels didn’t change colour quickly enough, input lag referred to a perceived delay between the video signal being sent to the monitor and the resulting update of the image data on the screen. In other words, the screen’s detractors claimed, there was a noticeable lag between the physical mouse input and the movement of the cursor or crosshair on the screen. On the desktop, this gave the 2405FPW a curiously sticky, disconnected feel. In games, particularly first person shooters, it made the 2405FPW borderline unusable for some lag-sensitive players. Other screens soon became infamous for their tendency to suffer from input lag, most notably Samsung’s SyncMaster 244T, another 24-inch PVA monitor. Compared to the instantaneous output of an analogue CRT monitor, the process of translating a digital signal into an image across the pixel grid of an LCD panel will obviously result in at least some lag on all LCD monitors, but it seems clear that excessive input lag appears to only affect PVA panels with overdrive technology (with the exception of the closely related MVA panel type). That said, the precise details of how overdrive technology causes input lag aren’t clear. We contacted Dell and Samsung to discuss the causes of the excess lag seen on certain PVA monitors, but both eventually declined to comment. Initially, we thought ignorance was probably to blame. Input lag has yet to become part of the standard lexicon when discussing TFTs – few in the industry are even aware of the problem. However, we’re pretty confident there are engineers and product managers at both companies who are. We pushed hard enough for answers to suspect that their silence was more a case of opting to keep quiet than of complete ignorance.